Repealing Obamacare Threatens Health Benefit To Black Lung Survivors : Shots - Health News The Affordable Care Act made it faster and easier for a coal miner with black lung to get compensation benefits. Many in coal country want that provision retained, even if the larger law is repealed. James Bounds is a West Virginia miner with black lung disease; it took him 4 1/2 years to get compensation benefits. A provision in Obamacare later made qualifying for those benefits much easier. 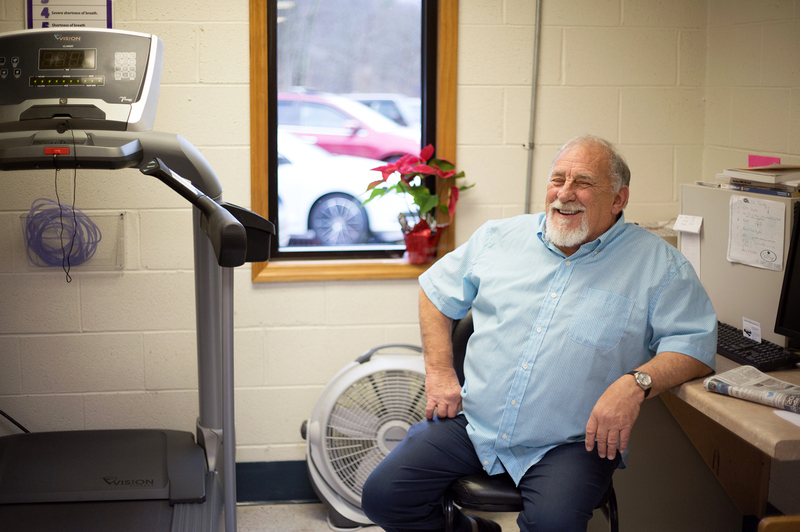 At the Pulmonary Rehabilitation Clinic in Scarbro, W.Va., oxygen tubes dangle from the noses of three miners slowly pedaling on stationary bikes. All of these men have black lung — a disease caused by breathing in coal dust. Over time, the dust coats the lungs and causes them to harden. Hard lungs don't easily expand and contract, and that makes it difficult to breathe. "You try to get air in them, and they don't want to cooperate with you as they did before," says retired miner James Bounds, speaking with great effort. Not every coal miner gets black lung, just as some smokers don't get cancer. But for those who do, Bounds says, the disease is devastating. "There's no cure at all," he says. "It keeps getting harder and harder until one day, I guess, you take your last breath and they won't expand for you no more." Bounds is one of about 38,000 miners or eligible survivors — usually a spouse — currently receiving black lung benefits. The benefits are compensation for the physical damage Bounds sustained while doing his job. It took him 4 1/2 years to get approved, despite the fact that his lungs are so bad he has to stop moving to talk. But now the qualification process is supposed to move faster. The Affordable Care Act includes special provisions that make the process of getting black lung benefits easier for coal miners. If the ACA is repealed, gaining these benefits could become much more difficult, effectively harming a group of people that President Trump has promised to protect. Debbie Wills coordinates the black lung program for Valley Health primary care system. She says that prior to the ACA, it was almost impossible to qualify for the compensation benefits. Coal companies pay the benefits, and also pay into a federal trust fund that pays when coal companies can't. Wills says the process of getting benefits was arduous for miners. "Coal company lawyers would doctor shop around the country and find two, three, four, five, seven doctors to say, 'Yes this miner is disabled, but it's not because of black lung,'" she says. The Affordable Care Act includes something called the Byrd Amendments. One shifts the burden of proof — instead of miners having to prove that mining caused their black lung, the coal companies have to prove that mining didn't. "You still have to prove the 100 percent disability, which is hard," says Wills. "But if you can prove that, and if you've worked 15 or more years or longer in the mines, then you're entitled to a presumption that your disease arose from your coal mine employment." Another part provides lifetime benefits to certain dependents who survive the death of a miner, if the miner had been receiving the benefits before death. If the ACA is repealed without a replacement, cases that were approved after the ACA went into effect could be reopened, leaving the miner or survivor vulnerable to losing the benefits. And, the burden of proof may shift again, making it difficult for applicants to qualify. Earlier this month, both the House and the Senate introduced resolutions to preserve the Byrd Amendments from a broader ACA repeal. Rep. Evan Jenkins , R-W.Va., an ACA opponent, introduced the measure in the House. "I am a firm believer that Obamacare is already in a death spiral and desperately needs to be fixed," Jenkins says. "While we are going to work to improve our health care system, I feel strongly about my resolution to make sure that the presumption relating to black lung is contained in whatever is the end product of this work this year." This story is part of NPR's reporting partnership with West Virginia Public Broadcasting and Kaiser Health News.